I’ve been rather absent from blogging this month, concentrating on producing new work and preparing for two shows convering the end of May and early June. I’m pleased to say the group show at the A Jain Marunouchi Gallery New York is up and running. I didn’t curate the show and through circumstances was unaware the artists mentioned in my previous entry were not involved. However, I’m glad to say I’ve had the honour of exhibiting with some very talented painters; Irina Avilova, Shahla Rosa and Sally Tsou and I’m thankful for the support artist Marina Reiter has provided in allowing us this flatform. 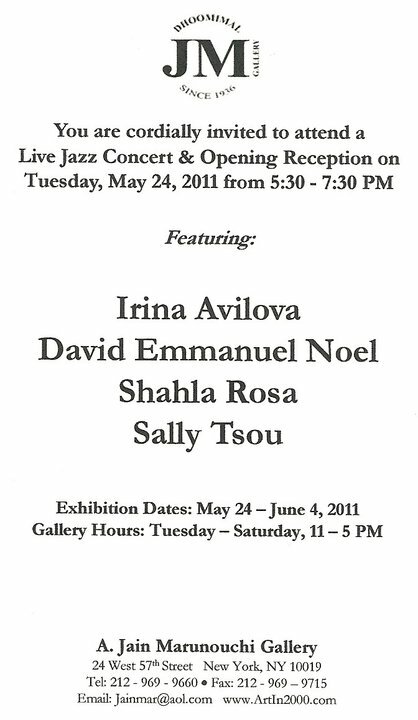 The group show is one of two exhibitions running at the gallery until June 4th. The second show features Norwegian born Inga Dalsegg. I hope if you’re in town you have time to see this varied selection of work. For a number of years the A Jain Marunouchi Gallery flourished as a destination for established and emerging artists alike, helping make art more accessible to the public,promoting works through various publications and art fairs. As the1990s came to an end, the art market began to shift from SoHo to Chelsea and Midtown Manhattan. It was at this point that the gallery moved to its current location at New York’s Gallery Building, For the past eleven years A. Jain Marunouchi Gallery has exhibited and represented a diverse range of artists whose works span continents, genres, and mediums.